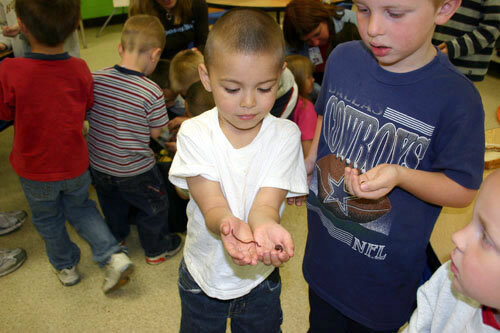 Targeted for 5th grade, kids will love diving into exploring the world of wiggling worms. Vermicomposting is a North Carolina 4-H curriculum developed by Rhonda Sherman, Extension Specialist for Solid Waste Management in the Department of Horticultural Science at NC State and provides ample opportunities for children to learn first hand about communities and ecological systems they are a part of. The curriculum includes an accompanying CD, which offers a visual reference not found in traditional classroom lectures. In addition, there is a training PowerPoint presentation with teacher training generally provided by your local county 4-H agent. Lesson 1: Introduction to Vermicomposting What is Vermicomposting? Lesson 5: Identifying Ways to Reduce the Amount of Waste in our Lives Recycle, Reuse, Re-Imagine! The 4-H Vermicomposting program offers fifth-grade students an opportunity to explore a micro-community. This community contains producers, consumers, and decomposers (as all communities do), and students are encouraged to reflect upon their learning as they achieve mastery of the concepts in producing this curriculum we have kept in mind that teachers are busy people. Therefore, each of the six lessons is tied to the Department of Public Instruction Standard Course of Study. Have you ever wondered what all those worms are doing under-ground? What do they eat, and how do they move? Worms help to create new soil and keep the forest floor clean of debris. Worms are valuable in the garden, too. A companion guide for high school students developed in part by NC 4-H Forestry and Wildlife Specialist, Renee Strand.